Can you believe that it is only 21 days until winter and just 25 until Christmas? Seriously, where does the time go? Oh wait, that's write, my dissertation. Also on my wish list are dolly socks. If you have not noticed, I've really been into this look lately. It is the perfect combination of cute and practical. I plan to wear my new dolly socks with these gorgeous (and ridiculously well-priced) velvet Mary Jane's. I scored them from Macy's during Cyber Monday for $44! 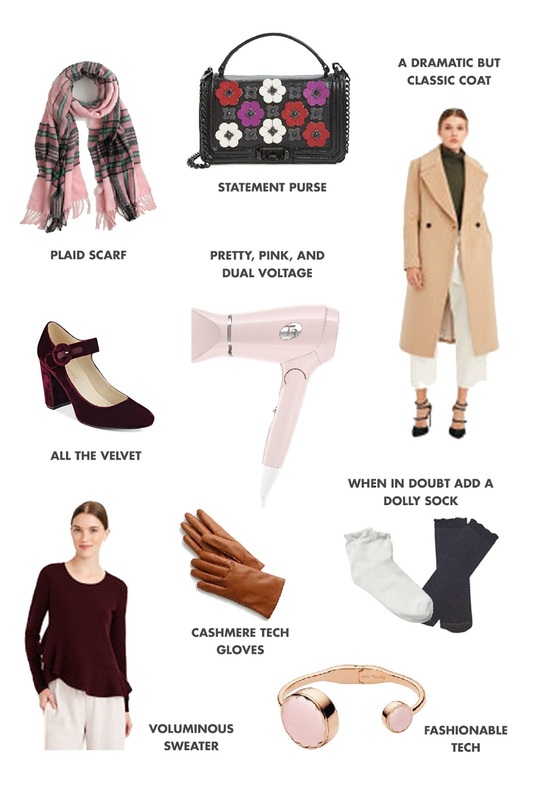 Other winter accessories on my radar are this sweet pink and green plaid J.Crew scarf and leather and cashmere tech gloves (such a great gift idea!). Speaking of style meeting function, I am dying to try Kate Spade's new wearable tech. They now have a smart watch and bangle that tracks your steps and allows you to set and monitor fitness goals. The last item on my list is something that I have needed for a while now and, for some reason, have not purchased! I love this small (and pink) dual voltage travel blowdryer by T3. A great travel blowdryer is the perfect gift for the wanderluster in your life.